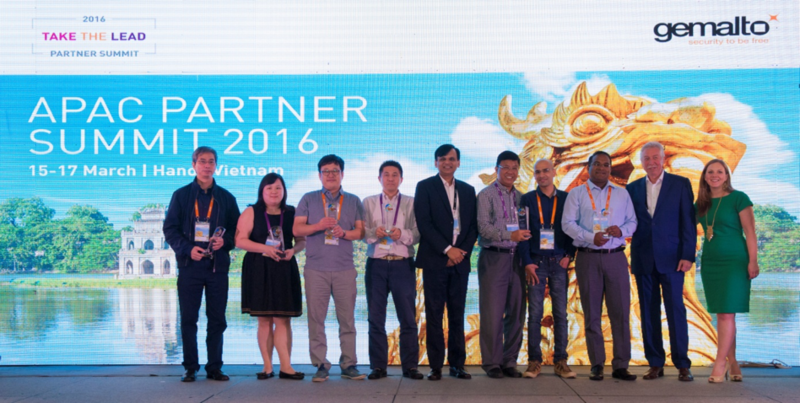 AMSTERDAM, March 17, 2016 - Gemalto (Euronext NL0000400653 GTO), the world leader in digital security, announced the winners of its 2015 APAC Annual Cipher Partner Awards. Each of the awards recognizes the individual achievements of Gemalto’s indirect channel partners and their contributions to help protect customers from data security threats. This year’s awards ceremony was held on March 16 in Hanoi, Vietnam. In recognition of the contributions and support by Gemalto’s indirect channel partners, Transition Systems has been presented with 2 prestigious accolades – “Top Contributor of the Year” and “Marketing Excellence Award”. PT. Transition Systems Indonesia received the Marketing Excellence Award for generating the most sales opportunities from Gemalto’s partner marketing campaigns in 2015. In addition, Transition Indonesia conducted a series of advanced trainings to familiarize its engineers with Gemalto’s products and turn them into product evangelists for Gemalto’s solutions. The Top Contributor of the Year award was given to Transition Systems India, a partner for more than a decade specializing in the banking and financial services industry, which generated the most partner revenue in 2015. On the above picture from right to left: Ms Trisha Paine (VP Marketing, Identity & Data Protection, Gemalto), Mr Gary Clark (Sr. VP Global Sales, Identity & Data Protection, Gemalto), Mr Ashwin Kulasekhar (Sales Director, Transition Systems India), Mr Bhavin Sampat (Business Manager, Transition Systems India), Mr Rudy Manurung (Country Manager, Transition Systems Indonesia) and Mr. Rana Gupta (Vice President, Identity and Data Protection, Asia Pacific, Gemalto). Our 14,000+ employees operate out of 118 offices, 45 personalization and data centers, and 27 research and software development centers located in 52 countries. Founded in 1999, Transition Systems is a leading value-added distributor of network, security and unified communications solutions in Asia Pacific region. Transition Systems partners with the world-class equipment manufacturers to provide resellers with an end-to-end solution portfolio to meet the needs of today’s business landscape. Transition Systems is now an Exclusive Group Company known as Exclusive Networks.